Figure 1. A face-up view of the black diamond. Photo by Robison McMurtry. 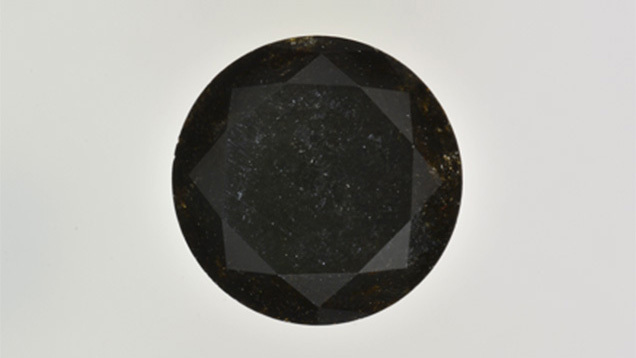 A 1.75 ct Fancy black round brilliant diamond (figure 1) was submitted to the Carlsbad laboratory for color origin determination. Natural black diamonds are usually colored by inclusions of sulfides, graphite or other mineral inclusions or, in rare cases, hydrogen-related clouds thatextend throughout the stone. Treated black diamonds are generally heavily fractured stones that are subjected to high-temperature, low-pressure treatment, which graphitizes the fractures, turning them black. Artificial irradiation can also produce a dark enough color so as to appear black, but this is less common (H. Kitawaki, “Gem diamonds: Causes and colors,” New Diamond and Frontier Carbon Tech­nology, Vol. 17, No. 3, 2007, pp. 119–126). Upon initial examination, the stone was noted to be covered in large, deeply penetrating fractures; therefore, high-pressure, low-temperature treatment was suspected. Yet closer examination revealed that the fractures were sur­rounded by dark brown radiation stains. Patches of non-fractured surface on the pavilion showed the normal transparency of diamond, causing the radiation staining to stand out in relief. Because radiation stains in diamond are inert to short-wave ultraviolet light, we placed the stone in a DTC DiamondView to confirm their identity. Figure 2 shows numerous fractures surrounded by dark bands, which are the radiation stains. Figure 2. A DiamondView image showing the pattern of inert radiation stains following the fractures in the stone. Image by Troy Ardon. Figure 3. This image of the pavilion shows the patchwork nature of the radiation staining. Photomicrograph by Troy Ardon; magnified 55×. Natural radiation stains provide an important clue to the color origin of a diamond. Diamonds that have been naturally colored by radiation can have stains associated with that color, though this is not a definitive criterion. In this case, the stains are so numerous and thick that they cause the diamond color. 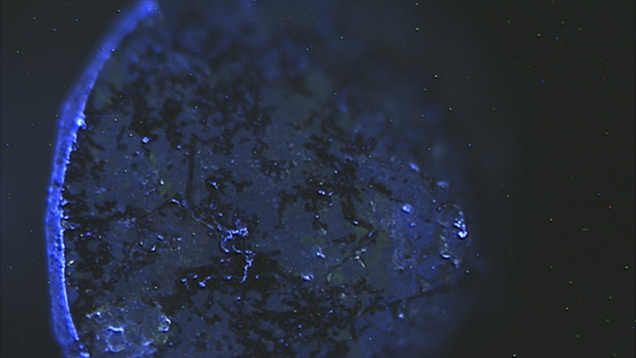 A close-up view of the pavilion (figure 3) shows the relative transparency of the diamond contrasted with the highly saturated color of the radiation staining of the fractures. The coverage of the stains is so complete that only a few transparent areas canbe seen in the face-up view. 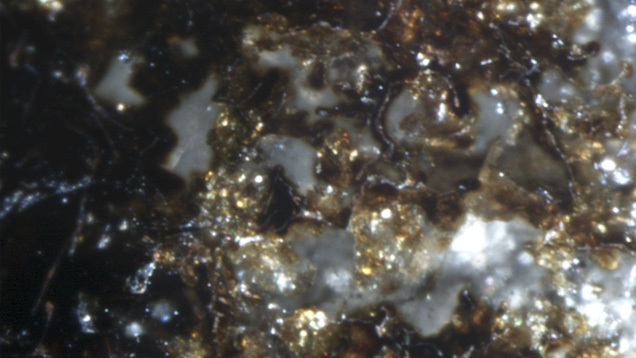 Some of the color was due to the presence of small black inclusions, but most was due solely to the natural radiation stains, an unusual cause of color. Troy Ardon is a staff gemologist and diamond color origin specialist at GIA's laboratory in Carlsbad, California.